Recently, the Hog Roast Wetherby team were hired by Joe to deliver a hog roast buffet at his event, a christening. Joe also hired a local venue, Thorganby Village Hall, in York to host his event at. 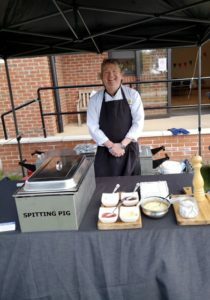 Luckily for the guests, the event had some fantastic weather and the Hog Roast Wetherby team were able to serve their buffet outside. Overall, the event was a fantastic turnout and the client was really pleased with the outcome. Joe chose Menu One for the Hog Roast Wetherby team to serve at the christening. A vegetarian option of lightly grilled vegetable and halloumi skewers served with pitta breads and a tzatziki dip was served on the buffet. Alongside this, the main meat, a slow roasted hog, was prepared and cooked on site in one of the Hog Roast Wetherby team’s Hog Master machines. The hog meat was served on the buffet table alongside crispy crackling, apple sauce and homemade stuffing. The meat was carved by the team’s Catering Manager on site infront of the guests and the meat looked fantastic as the centrepiece of the buffet. The meat was seasoned by the team to ensure that it tasted really flavorful. In addition, a selection of bread rolls and wraps were served in wicker baskets to serve with the meat for the more casual occasion. 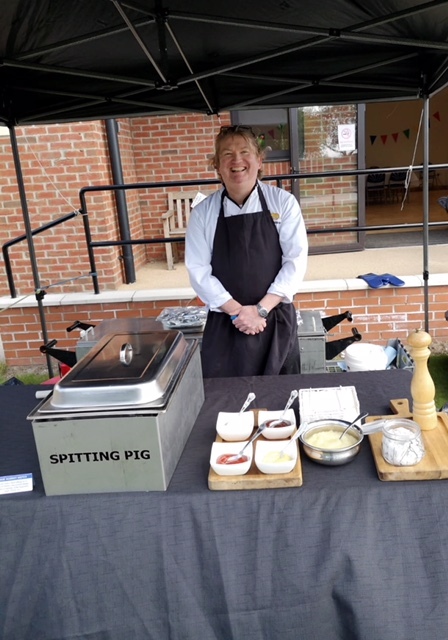 The Hog Roast Wetherby team’s Catering Manager, Jon, did a fantastic job of leading his team through the busy service. They were serving their buffet to 75 people, a perfect party size for the team’s buffet. The buffet was served as a lunch time menu at 12 noon so it was important that the food was served on time as the team did not want the team to go hungry. The food was served in metal trays to ensure that the food remained hot throughout the service as it was served outside. In addition, the selection of sauces were served in help yourself dishes along the buffet table. After the service, all of the refuse and equipment was cleared and taken away by the Hog Roast Wetherby team discreetly. Hog Roast Harrogate Caters for Schofield Money! Copyright © 2019 Spitting Pig Yorkshire . All Rights Reserved.